We will begin a new (7 week) Adult Religious Education program: FULFILLED (Part two) on Tuesday - February 5 - 9:45 a.m. to 11:15 a.m. (Morning Session) & 7:00 p.m. to 8:30 p.m. (Evening Session). We are currently offering FULFILLED (Part One) - ending on January 22 - However, a participant can do Part Two without having completed Part One. Following the layout of the Old Testament Tabernacle, the program is divided into a study addressing the Outer Tabernacle (Part One: Called into His Presence) and (Part Two: Drawn into the Divine Mystery). FULFILLED (Part Two) - Drawn into the Divine Mystery focuses on elements of the inner sanctuary of the Tabernacle and how they connect to the Magisterium, the Eucharist, incense, Mary and more. The course fee = $25.00 (includes a study guide and refreshments). Have you ever been unable to explain the "why" of Catholic beliefs? Have you ever wondered why the Old Testament sounds so different from the New Testament? In the Old Testament, God began building a plan and laying a foundation for the beautiful traditions of the Catholic Faith. That plan was fulfilled by Jesus in the New Testament. Fulfilled: Uncovering the Biblical Foundations of Catholicism is an apologetic approach to sharing the Catholic Faith using the Old Testament Tabernacle as a blueprint for God's plan. While it is designed as a faith-sharing Scripture study, you will also gain an understanding of some of the most questioned Catholic teachings. 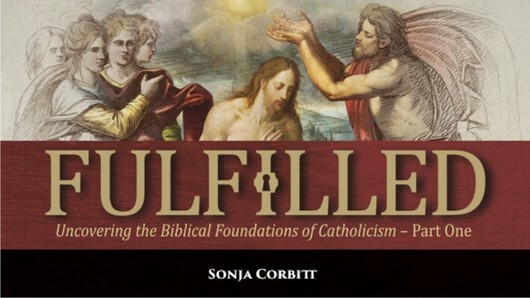 Fulfilled: Uncovering the Biblical Foundations of Catholicism will reignite your love of Scripture and help you share and defend the Catholic Faith with the Word of God. Part One focuses on the elements found in the outer sanctuary of the Tabernacle and how they connect to the liturgical calendar, the priesthood, purgatory, baptism, and more. Part Two (coming soon) focuses on the elements found in the inner sanctuary of the Tabernacle and how they connect to the Magisterium, the Eucharist, incense, Mary and more.